All-species fitness: Seahorses are the only fish species that can hold your hand! For one, they can change color to blend into their environment, which makes them hard to both find and tell apart. For fish that swim so slowly, camouflage is the key to survival. It actually prevented scientists, for many years, from determining how many distinct species of seahorses existed (there are 47). Perhaps even more interesting --the males take on a big reproductive responsibility -- unusual in most animals. 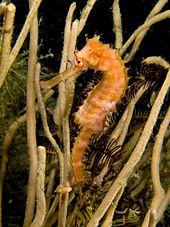 Seahorses are monogamous and some mate for life, which is already a big commitment, but the males also give birth. 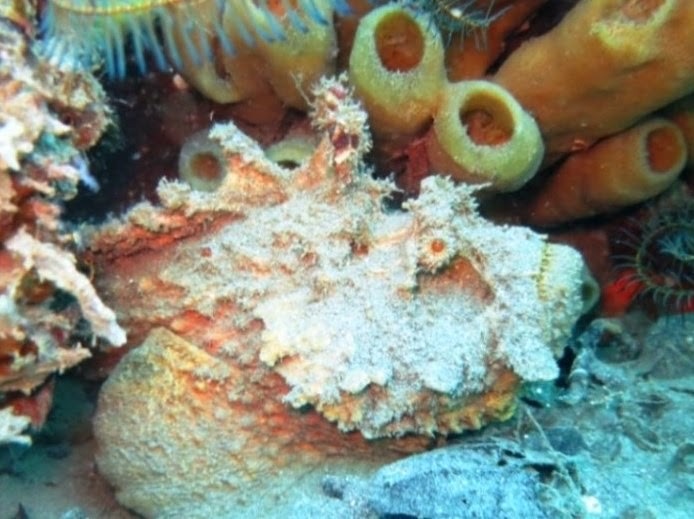 The female gets pregnant and transfers eggs, containing developing seahorse embryos, to the male, who carries and protects the eggs until they hatch. 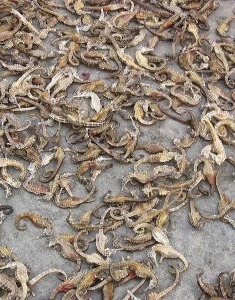 This takes about 2 weeks, when the fry (baby seahorses) pop out, ready to swim off into the wild blue yonder. Why would they mate for whole seasons, or even for life, something very unusual among all animals, especially in fish. spiny seahorse waiting for food - or a mate? Remember that they are poor swimmers and do a lot of hanging on to aquatic vegetation pretending to look like seaweed to not only fool potential prey but also to avoid getting eaten themselves. Plus the ocean is really big. So finding a mate can be both difficult and risky. Staying with one partner and having the male protecting the eggs allows the female to get pregnant more frequently (more mating!) during a single mating season, which they hope will result in greater reproductive success. 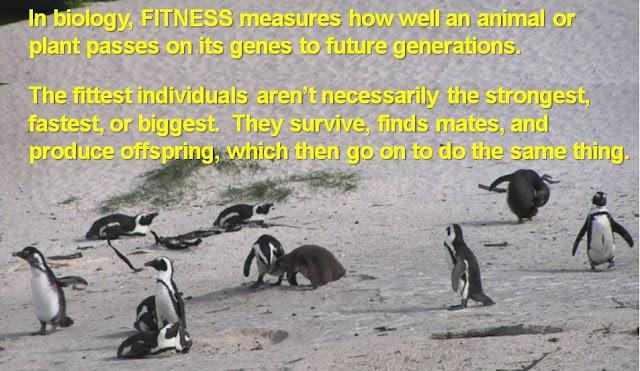 And greater reproductive success means more offspring, more of their genes in the next generation, and therefore greater biological fitness. How do we know they stay together? Each morning, seahorse couples greet each other by promenading and dancing together that sometimes involves changing color. 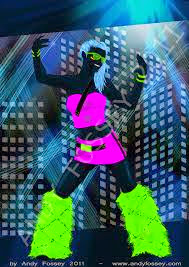 What color would you dance, if you could? They reconnect like this for several minutes each morning to confirm that the other partner is OK, still happy with the relationship, and even synchronize their reproductive cycles. Then they go their separate ways to find food for the rest of the day. 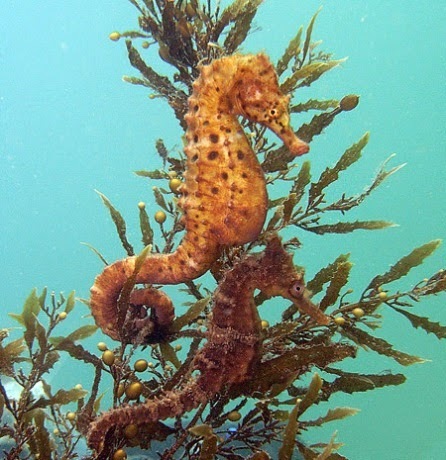 Because each seahorse mates with only one partner, and the male must survive long enough for the young to hatch their way to independence, overfishing reduces seahorse populations particularly quickly. In fact, over a third of seahorse species are vulnerable to extinction, according to the World Conservation Union’s IUCN Red List. Few cultures depend on seahorses for food, although reliance on them may increase as other fisheries decline. Even more threatening to seahorse populations is the their use in traditional medicine by China, Korea, and Japan to supposedly treat asthma, sexual dysfunction, and other ailments, and the killing of seahorses to sell as "curios." It seems to me that killing rare and interesting animals because you want a dead one in your house seems pretty brutal and completely unnecessary, particularly in today's world of amazing online photos, videos, aquariums, and museums. 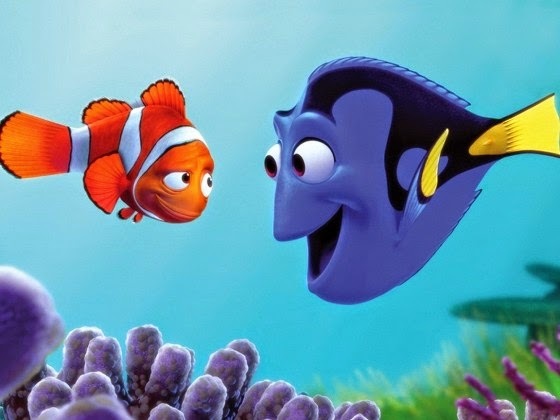 And taking any animal away from its native environment, where it plays a role in keeping it functioning, to put it your aquarium tank, harms both the animal and the environment that lost it. They don't look so good dead and dried, and they don't improve sexual problems, so let's try to keep them in the sea, dancing and changing color to the rhythm of the waves. Learn more: here are some essential facts about seahorses from Project Seahorse!